You know they exist now, so it adds little to say that I owned one as a child... except that the little yellow button on top produces the feeblest light from the right of the display, oh, and time is cubic, obv. I used to own one of these clocks too! Are they really still in production? I have one of these little babies - in love is the word you're looking for!!! The only thing is the light on the top stopped working after a couple of years. I still use mine now and it has been in daily use for nearly 20 years. It is looking a bit tatty now though and i am dying to find another one. If anyone can help i'd be really grateful. Email me: lilli333@aol.com. Cheers!!! I've got one of these – my sister bought it for me for either Christmas or my Birthday (I can't remember which now). 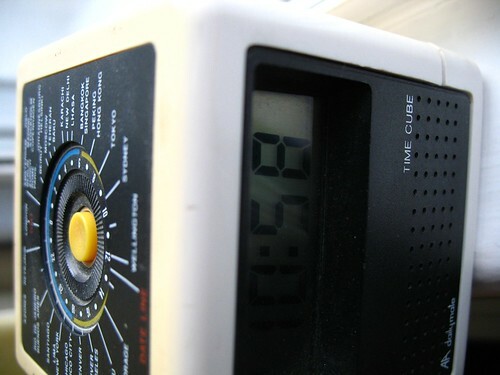 It must be well over 20-years old now – and it IS definitely the best alarm-clock I've ever owned! Due to the snooze function 'giving up the ghost' this morning, I thought I'd try online to see if they still made these – it's a shame that that looks like a big 'N-O'; if they still did, I'd have rushed through an order for another like 'pronto'... I DO like my 'snooze' in the mornings, you know!!! I am also a proud owner of a dailymate TIME CUBE. It came from Argos and my mother bought it for me when I went to secondary school. I personalised it with glow in the dark ghostbusters 2 stickers. Sadly the alarm no longer sounds and the stickers no longer glow but I can still find out the time in Peking or Calgary. Whoops, that image didn't work very well did it. maybe this will? My Dad brought me this clock from Argos in Liverpool back in 1987 and I still wake to its alarm today.That little cube has been around the world with me and its still working perfectly.I did take it apart a few years back and managed to repair the light and alarm ,so here s to many more years of timekeeping with my cube shaped "mate"
Just found the battery lid for my TIME CUBE while digging out my old Playmobil for my son. Only then i realized using this alarm clock all my life. Must have lost the lid back in the 80s. I totally agree to the advantages you put out - but how could one get along with only 4 minutes of snoozing ?? My all black TIME CUBE gives me 6 minutes - thats the perfect time. Allows you another little dream that you could never reach in 4 minutes. And not lets you fall back too deep like 8 minutes. Wow, just stumbled across this page. I too have had a timecube since forever and I'm sure it is only on its second battery ever despite the alarm going off every day because the slider on the bottom seems to move of its own accord due to wear and tear switching the alarm back on after I have turned it off. Check out the second series of Red Dwarf, there are a couple of episodes where you see a timecube on Lister's top bunk! My timecube also came from Argos in either Birkenhead or Liverpool so there seems to be a connection there. My Dad once told me that he wondered why I always placed it on its side rather than the bottom. He once lay on my bed (to watch the racing when the downstairs TV was out of action) and realised why. When lying down you don't have to mentally rotate the digits 90 degrees (or bother to move your head more to the point) if the cube is on its side. I could see he was impressed with my lazy ingenuity. I had one of these too! My grandma gave it to me for my 6th birthday in 1985 and it worked perfectly for more than 20 years, using I'm sure only around 3 batteries in that time... I was actually searching online to see if they were still made so I could get one for my daughter, but seeing as they all seem to still be working decades later perhaps I'll just dig my old one out of my dad's attic! Just found this page. I can't change the time on this for my mum. Anyone know how to do it? I've tried switching the time set on and off, but no luck. 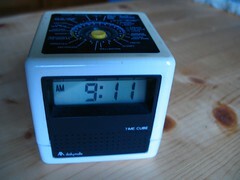 I bought my cube clock in 1969 from the NAAFI in Victory Barracks in Portsmouth. I had just joined the WRNS and needed a wake up call. I still use the clock every day and take it with me wherever I travel. I can only remember changing the battery twice and am completely reliant on it for my daily alarm, it has never let me down. It has gone somewhat discoloured over the years but I guess I have as well!! Long may the clock continue, I think it may see me out!